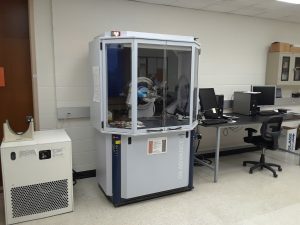 Installed in 2008, the Bruker D8 Advance provides routine, qualitative mineral identification in rock powders. The D8 XRD is now driven by automation software with integrated pattern analysis by Bruker EVA and Topas using the ICDD PDF-2 Minerals database. 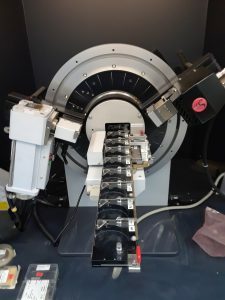 Samples for XRD must be carefully ground rock powders (no gritty lumps) or fine size fractions separated by centrifugation or gravity settling. Ideally, the mineral phases of interest should be present in amounts of at least several percent. Otherwise, some method of concentrating the phase will be necessary. All internal users must take OH306 X-ray safety training through the UT-Austin EHS. A certificate of completion must be provided to the lab manager before you can begin in-lab instrument-specific training. All in-house training on the XRD is provided on a needs basis. Users that have completed OH306 and the in-lab instrument-specific training should contact the lab manager to request time on the instrument. Once your request for instrument time is approved, users should follow the “Scheduling and Rate Structure” tab on the right-hand side of this page to schedule instrument time. Note that we do have software and database capabilities to perform data analysis tasks. Data analysis and interpretation is not routine. As such, the end user is responsible for their own interpretations. Those end users desiring assistance with data analysis and interpretation can enlist the help of lab personnel as a research collaboration. Extensive support materials for data analysis are available in the lab. Users may request access.